The round-robin procedure aims at identifying the “best” algorithms in enabling different external research groups to develop methodologies and demonstrate their performance. It will allow comparing varying algorithms and gaining insight into their capacity to meet the targeted criteria defined in the Product Specification Document. The entire effort is organized as transparent as possible. All participants evolve within a standardized environment: they have the same information about context and objective and they work with the same dataset. The scope of the exercise, the input dataset, the expected output, the validation dataset and the evaluation methodology are defined in advance and described in a Round-Robin Protocol document. The CCI Land Cover project aims at delivering, in a consistent way over years, global land cover products matching the needs of key users belonging to the climate modelling community. To this end, a prototype system will be developed, based on a set of pre-processing and classification algorithms. 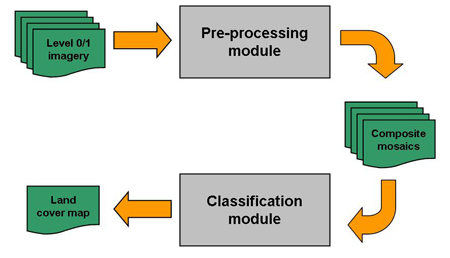 The classification module is articulated to the pre-processing one. The pre-processing module starts from L1B imagery and produces global composited mosaics of land surface reflectance values. These mosaics serve as input to the classification module, which interprets them into land cover classes. This Round-Robin activity concentrates on specific algorithmic steps of the pre-processing and classification modules (with for each step, specific input and output dataset). More information is available about the Round-Robin participation, data access and timeline.